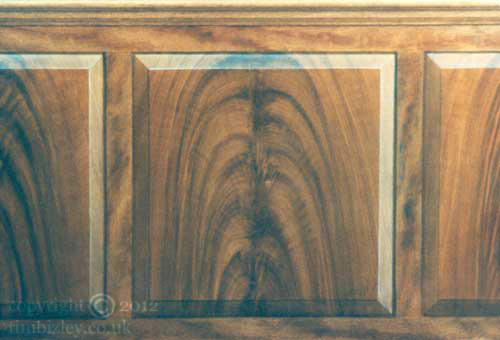 This trompe l'oeil panel system in feathered mahogany shows how a wood graining paint effect can be tromped up to produce interest and definition where the extant architecture is uninspiring. The design, which incorporates dado paneling, ran around the room and included doors, architraves, and fitted units. The scheme linked strongly to the clients collection of French Empire furniture. Specialist decoration can transform interiors so that they strongly support other decorative elements in the design scheme.